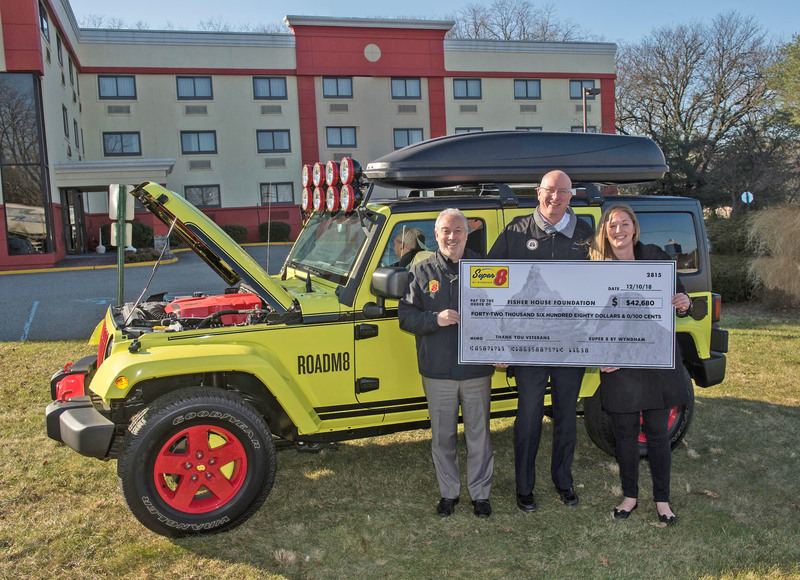 Super 8® by Wyndham today announced the donation of more than $42,000 to leading military and veteran non-profit Fisher House Foundation, following the sale of its one-of-a-kind, hotel-centric concept car ROADM8, which first made its debut at the 2018 New York International Auto Show. 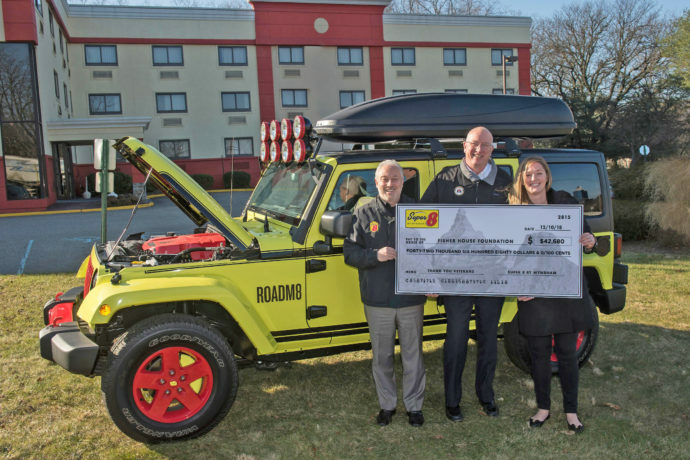 Inspired by major room renovations at Super 8 hotels across the U.S. and Canada and built by industry-leading fabricators, the vehicle, which was sold via online public auction, is the latest in a series of initiatives by the world’s largest economy hotel brand to show its continued support for those who serve. One of the nation’s leading military and veteran non-profits, Fisher House Foundation provides a no cost, “home away from home” for families of patients receiving medical care at major military and VA medical centers. Through their Fisher House homes and programs, such as Hotels for Heroes and Hero Miles, they’ve saved military and veterans’ families an estimated $400+ million in out of pocket costs for lodging and transportation. To learn more, or to make a donation, visit www.fisherhouse.org. Created from the base of a 2017 Jeep Wrangler Unlimited Sport 4×4, ROADM8 is the first ever concept car from a hotel brand and was designed to evoke the warm colors, sleek finishes and hyper-local black and white art of Super 8’s newly renovated rooms. The ultimate road trip companion—just like Super 8 hotels—it features innovative amenities like an on-demand coffee maker, a built-in mini-fridge, tablet entertainment, easy USB charging and Wi-Fi, among others. Learn more about ROADM8 at www.super8.com/ROADM8. For more information on Super 8 and its efforts to support those who serve, visit www.super8.com/military. For more than four decades, Super 8® by Wyndham—the world’s largest economy hotel brand with more than 2,800 hotels globally—has served as a trusted and convenient companion on the road. Today, we’re on a mission to elevate economy, modernizing the brand for the next generation of traveler with newly redesigned rooms, fast, free Wi-Fi and a complimentary SuperStart® breakfast. A strong supporter of our servicemen and women, Super 8 is proud to offer reserved parking for Veterans at all North American locations along with a 15% discount to members of the military and their families. To learn more, or to book your next stay, visit www.super8.com. You can also like us on Facebook (www.facebook.com/super8) and follow us on Instagram (www.instagram.com/super8). See you on the road. Fisher House Foundation is best known for a network of comfort homes where military and veterans’ families can stay at no cost while a loved one is receiving treatment. These homes are located at major military and VA medical centers nationwide, and in Europe, close to the medical center or hospital it serves. Fisher Houses have up to 21 suites, with private bedrooms and baths. Families share a common kitchen, laundry facilities, a warm dining room and an inviting living room. Fisher House Foundation ensures that there is never a lodging fee. Since inception, the program has saved military and veterans’ families an estimated $400+ million in out of pocket costs for lodging and transportation.